The Goldsmiths Jewellers workshop of Lorenzo Mattafirri - Orafo Design - may be found down a very steep street in the centre of the stunning medieval city of Massa Marittima in Maremma. Lorenzo is an "orafo", an Italian goldsmith, whose work is entirely handmade without the use of ready-made or microfusion (cast) parts. 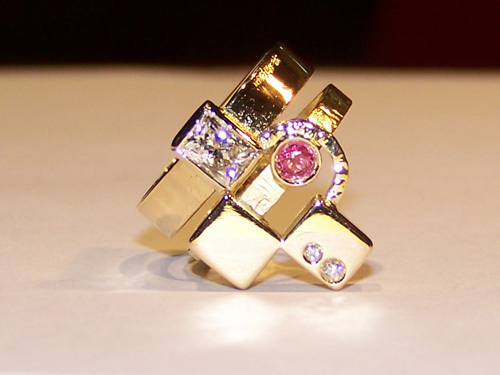 He works with precious metals and precious and semi-precious gemstones to create unique pieces of stylish Italian jewelry. His workshop, which has wonderful original medieval arched ceilings, is full of sketches of his designs. 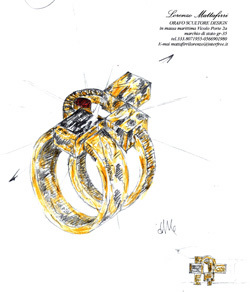 The one shown below is the sketch for the beautiful gemstone gold ring in the photograph above. Lorenzo welcomes jewelry commissions and is happy to work with a client to bring to life a design of their own in solid silver and/or gold. 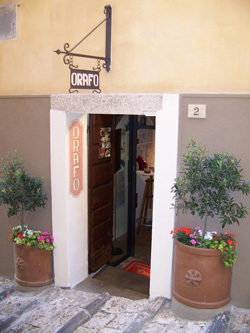 Orafo Design is a "laboratorio di artigiano", a workshop, rather than a "negozio", a shop. In the back room there are all the tools and machinery that you would usually find in a goldsmiths and silversmiths workshop. Many of the tools and techniques that a goldsmith such as Lorenzo uses every day are the same as those that have been used for centuries by craftsmen working with precious metals. For example, some of his creations are made by the ancient technique still used by artisan "orafi" (goldsmiths) throughout the world, that of "fusione in osso di seppia", cuttlefish bone casting. Unlike the window displays of the italian jewellers along the Ponte Vecchio in Florence, you will not find shelves upon shelves of gold necklaces and rings etc in Lorenzo's workshop. But, be aware as you enter Orafo Design, there is a tempting display of examples of his jewellery available to purchase. One of his more prestigious commissions was that in 1990 by AVIS di Massa Marittima ai Terzieri Massetani: the prize for the winner of the medieval Balestro del Girifalco - Gerfalcon Crossbow - competition. The competition is an important and historical event in Massa Marittima, with fierce rivalry between the competing quarters of the town for the title. Massa Marittima fills with local Maremmani and international spectators alike, colour, costume, music and pageant. 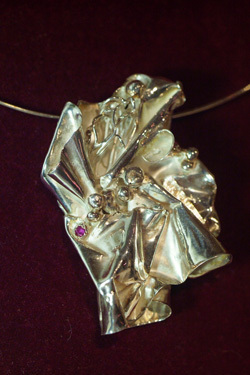 The prize crafted by Lorenzo is a very large medieval style necklace in silver and gold - see the photograph below. The competition is held twice a year and the necklace is passed to successive winners. 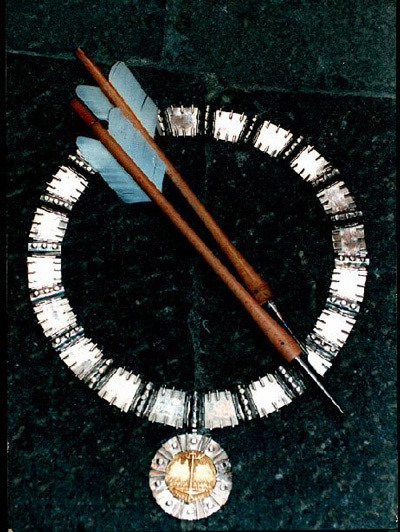 An important commission by AVIS di Massa Marittima ai Terzieri Massetani: a gold and silver necklace for the winner of the medieval Balestro del Girifalco - Gerfalcon Crossbow - competition. During the summer months, Lorenzo opens later in the mornings at 10:30, and remains open after dinner.